Freeport, Grand Bahama – AML Foods Ltd. has come to the rescue of The Grand Bahama Children’s Home (GBCH), in response to an urgent plea made by Executive Director Sheila Johnson-Smith via social media for diapers and wipes for the twenty-six children, currently living at the home in Freeport. Answering the call from Executives at the home, AML Foods jumped in to offer to match each purchase made by their customers towards the drive. The initiative, which launched on Friday, encourages customers to purchase diapers or wipes for the Home at Cost Right Freeport, Solomon’s Lucaya or Solomon’s Queen’s Highway. After purchase, customers can place the items in special marked bins located in the stores. AML has pledged to match each purchase of diapers or wipes, and donate all the items to the Home. 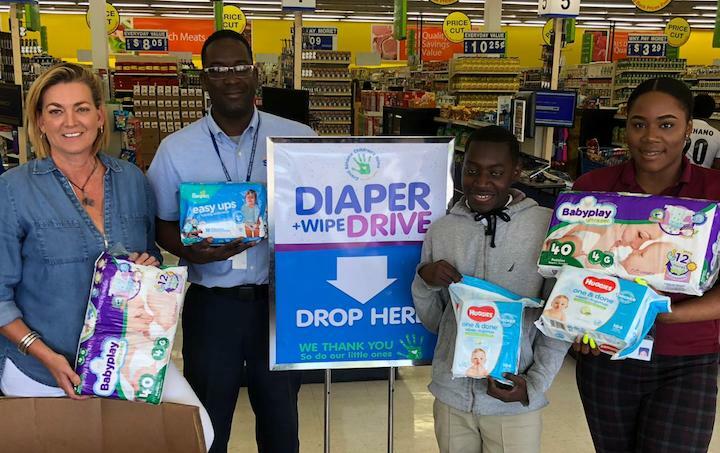 The “Diapers + Wipes” campaign will run in Cost Right Freeport and both Solomon’s locations on Queen’s Highway and Lucaya, until the end of April. AML Foods joins other corporate companies on Grand Bahama that have come forward to lend a helping hand to the home. Telecommunications company Aliv, was the first company to respond to the social media plea for diapers and wipes, but more support is welcomed. Persons interested in donating to the Grand Bahama Children’s Home, may contact the home at 352-7852, or visit the office on Tripp Lane, the home also has a website and social media page too.